Cathy Malkasian's Percy Gloom is a treatise on existentialism in the guise of a quick-read graphic novella. Published way back in 2007 (Oh, we were young then...) the story follows an immediately dour little worrywart of a man seeking to start a new life in a strange world abroad at an office for safety writing. (He's the type to enjoy determining how common household objects may hurt, maim or kill a person... it is his childhood dream.) But for such a sad character Percy Gloom, who subsists on only bran muffins and the juice of 30 lemons, he is remarkably adventurous. Malkasian first hands us a little sad sack and then shows us a redemptive tale about his growing into a positive risk-taker... who smiles. Through out the 160+ pages, text is meager, but perfectly expressive and well-characterized. Percy Gloom tackles cultist behavior and conflicting human desires to transcend life and hold onto it forever with a delicate, charming hand. In these things, these graphic novellas, art is paramount. Malkasian creates a unique world of caricature melded to reality. Forms are exaggerated, but never to the detriment of the narrative. And many of her creations have a Seussian design that makes them almost familiar enough to be old friends. 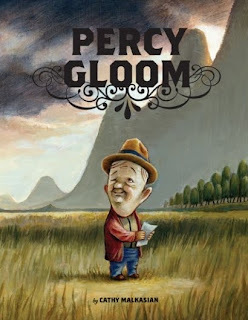 Percy Gloom, the man, is small, large-headed and big-eared (which turns out to be incredibly relevant) and his expressions demand the reader's love and admiration. Malkasian has created him for us to want him to succeed and not because he's Disney attractive... Beyond Percy, there are no two characters who look alike, from a kind doctor, to an inventive mother, to an ominous overweight child. Malkasian's little world is just the right size with just the right dose of weird to keep you feeling surprised, but never fully lost. The inner beauty lies in creative and heartfelt story telling. There's lost love, and fear of death, and the fear of the tedium of living, and fear of exploring new places. Each utterly visceral topic weaves into the narrative unpretentiously and nothing feels extraneous. Even a side story about two children seeking to avoid school by finding a special stone taps into basic human desires for freedom and choice. Are we meant to seek the afterlife, forgoing the world we have before us? Should we escape the world we live in forcibly to remove ourselves from the tedium? Or should we cling to life and youth, shunning age and wisdom? Maybe we should take life as it is and love living it while we can... Malkasian presents something that is as much as philosophical debate/treatise as it is a classic story, and that is perhaps the greatest success of the whole project. Available on Amazon cheap, and through local libraries, it's worth the 2 hours you may need to plow through it. Take the time to look deeply into the art, and keep an eye on the elements of the story that are downplayed purposefully. Percy Gloom is a classic that deserves a fresh look two years later and will remain timeless long after. With San Francisco in Mind.